A Sacramento City College student helps prepare his college's makerspace for launch. Six months after the official launch of a $17 million makerspace initiative, California community colleges are mass-producing student makers. The "CCC Maker Initiative" has funded makerspaces in 24 campuses with the intent of offering educational activities that will help students prepare for their careers. Each college received implementation grants of between $100,000 and $350,000, renewable for a second year. According to a near-real-time dashboard run by the project, 330 faculty members in 295 different courses have accessed makerspaces as part of their curriculum, and a total of 5,007 students have used the spaces. A makerspace provides professional-grade equipment such as 3D printers, laser etchers and other tools to allow users to create what they've designed, giving them hands-on experience and a creative taste of the manufacturing process. The state invested in the maker project to allow students to learn more about career options while enabling them to develop skills they can demonstrate to prospective employers. Sierra College acts as the initiative's fiscal agent and administrator. "Hundreds of 20-hour internships and work-based experiences coordinated by the educational makerspaces will result from this initiative," said Van Ton-Quinlivan, executive vice chancellor of Workforce & Digital Futures at the Chancellor's Office, in a prepared statement. Currently, 244 employers have been recruited to participate. Now, "student leaders" are emerging as well, helping to plan the spaces, promote special events, operate the equipment and do training. For example, at City College of San Francisco, architectural graphic students have redesigned one of the school's makerspaces, SmartHUB, and computer science students are creating a badge system for another makerspace's equipment on campus. At Glendale Community College, 35 students have volunteered to help run Glendale Tech Week and a Latinas-in-STEM workshop. 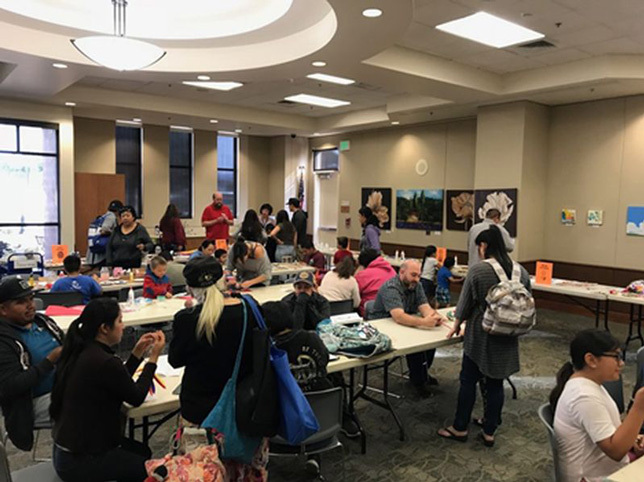 Community members attended a maker event jointly run by Allan Hancock Community College with Santa Maria Public Library and Santa Maria Discovery Museum. Among the classes that have used the makerspaces for student assignments, Folsom Lake College delivered "Making Social Change" in fall 2017; and Orange Coast College has developed an action sports curriculum to teach design, engineering and fabrication of skateboards, surfboards and standup paddleboards. "Makerspaces are widely recognized now as adaptive labs where learning is contextualized," said Sierra College Superintendent and President Willy Duncan. "Faculty can offer meaningful projects tied to curriculum and students gain practical skills by interacting with industry partners. In a college makerspace, students practice innovation, develop problem-solving skills and connect to industry partners in cutting edge fields. It is very motivating for students to see the application of what they have learned in the classroom."